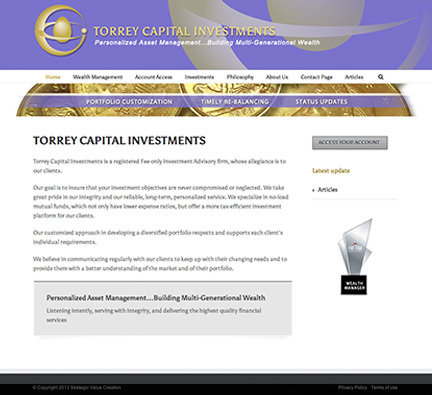 A new site for Torrey Capital Investments is live! Torrey capital investments is a successful registered Fee-only Investment Advisory firm located in Del Mar CA, specializing in wealth management. President Jackie Karnavas was looking to keep a very professional looking site, while softening the color palette and communicating approachability and service. She keept the gold form her previous branding direction, but we toned it down to make it more of an accent color. Click here to see C. Laurin Arts website portfolio.